The debate has been previously touched upon on this forum. The question is: How long does it take a coin to wear down to XF, VF, F etc. condition? It is not an easy question as a coin may be hidden from circulation for many years and then circulated for a brief time (or the other way around) – so although it is an “old” coin, it shows very little evidence of circulation. Another coin may have been quite recently issued, but in 2 or 3 years’ time have seen heavy circulation. But on average, one would expect a 1923 Shilling to show much more wear and tear than a 1960 Shilling as the period they could have circulated in started in 1923 and ended in 1960. If one takes the first decimal coin series of South Africa (1961 to 1964) for example, finding a 1961 date in less than XF condition is rare and finding that grade in a 1964 date is virtually impossible – the time they could have circulated in is simply too short. During the Anglo Boer War, many of the Boer Prisoners-of-War (POW) engraved a “Pipe and Hat” on the obverse of ZAR Coins. 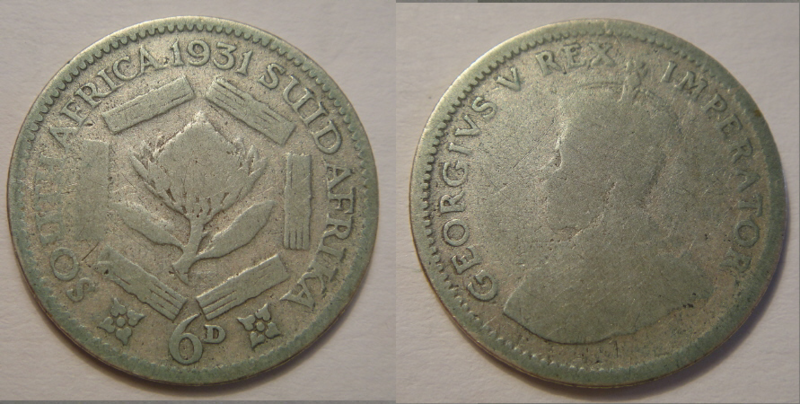 The (silver) coins were issued from 1892 to 1897 and the Boers were imprisoned from 1899 to 1902. Most of these engraved coins were kept as keep-sakes so did not circulate after the war. 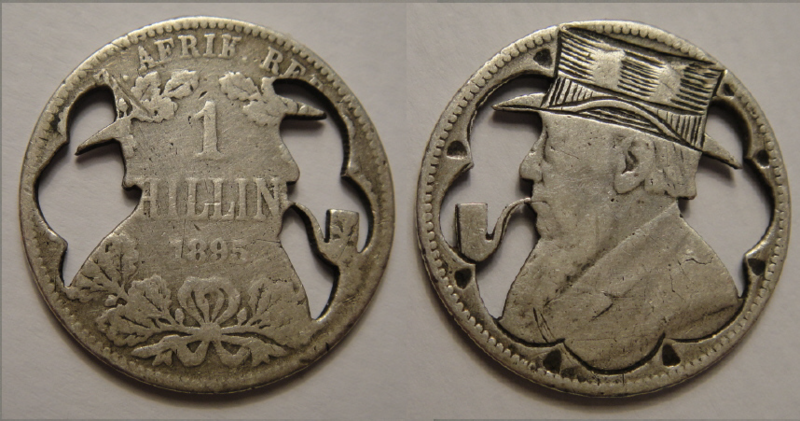 From this one can deduce that the longest period that these coins could circulate before they were engraved (and then stop circulating) were 10 years (1892-1902) and the shortest 2 years (1897-1899). If one look at examples of the ZAR P.O.W. pieces, some of the older dates show definite signs of heavy circulation, so one could deduce that in a period of less than a decade, silver coins could be circulated down to a low grade like VG, BUT I have seldom seen POW pieces dated say 1897 in very low grades. If one look at the Griqua coinage that only circulated for an extremely brief period (they arrived at Griquatown in around 1817 and only circulated up to 1820), one would see that the NGC pop reports show the lowest grade for a copper coin as VF and for a silver coin XF. This tie in with the condition seen of coins of our first decimal coin series (1961-1964) that also only circulated for a brief period of between 1 to 4 years. Lastly, it is a strange numismatic phenomenon in South Africa, that coins like the Mandela R5 series, is collected (by some collectors) according to its grade: – to complete the collection thus one should have say a XF40, XF45, AU50, AU53 etc. up to a MS70. The XF40 is probably scarcer than the MS62, so these collectors do not mind – they are willing to pay MORE for a XF40 than for some mint state coins. The fact that one could carry a Mandela R5 in your pocket and rub it for days on end and thus producing any grade you wish it to be in, has probably not dawned upon them yet. I am sure one could reduce the grade of a Mandela R5 coin in a relatively very short “rubbing period” to VG or worse. THAT would probably produce a unique coin (can you imagine a G3 Mandela R5) worth thousands to some – but in actual fact only worth R5. From all of this, I think one could deduce that it takes about 2-4 years for a coin to circulate down to XF and 5-7 years to circulate down to VF and so on and so forth. There are exceptions – especially the Boer Prison Camps where the ZAR coins they had in their possession could go nowhere “outside” but only circulate between themselves in the camps for a relatively short period. Here is a question for you Pierre. How prevalent in South Africa was it for designs no longer issued to still circulate? This to me would have the biggest influence on what you are attempting to quantify. In the USA prior to the switchover to base metals in 1965, collectors could in theory have regularly found coins dating back to 1909 since the designs didn't change often and the prior design continued to circulate. Not sure if it is a law but the practice was to keep a design for at least 25 years. An example would be Lincoln "Wheat Back" cents issued from 1909-1958 which was replaced with the Memorial reverse in 1959. Regularly though, they would have only found the later dates but occasionally the earlier ones. So in my example, probably mostly those issued after 1933 because that's when large scale collecting started. Today, I understand 5c coins dating to the early years of the Jefferson portrait (dated from 1938) can still be found, though the distinction here is that the design didn't change until 2004 (or thereabouts). 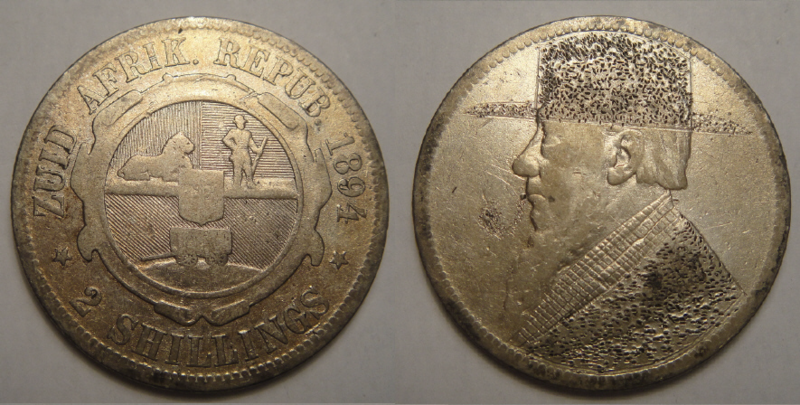 In Bolivia, an auction house once told me that the pillar coinage I collect (1767-1770) continued to circulate until the early 20th century, probably around 1909 though he didn't say it because that's when silver coinage was discontinued. That's why these coins are almost never found above basal and/or damaged condition. On your example with the Mandela coin, I suspect it would take quite a long time to reduce to a VG just by carrying it as a "pocket" piece, as in years or maybe a few decades unless the coins are made poorly. In US coinage, the "expected life" I understand is supposed to be 30 years. Given the quality and survival rates for both Union and ZAR, it is apparent that ZAR were removed from circulation both in greater number and much earlier presumably because of the much greater affinity for this coinage by those who did so. Regarding the Kruger coinage, Engelbrecht tells us that after the Boer War ended in 1902, banks in Natal and the Cape Colony refused to accept them. However, they continued to circulate in both the Transvaal and Free State and after unification in 1910, ZAR coins were declared legal currency in 1911 side by side with British coins. Only when our own Union coinage was introduced in 1923, were the Kruger Coins gradually withdrawn. Between 1923 and 1937, silver pieces to the value of £136 771 (of a total of £337 400) were withdrawn. When the mintage of Union coinage ended in 1960, their circulation continued for a brief period but by 1965/1966 had practically disappeared from circulation. The first decimal series (1961-1964) very quickly disappeared after 1964 because of their silver content and the only coins from this series to survive in circulation after that were the bronze ½ and 1c pieces that could still be found in pocket change by the late 1960s. As a boy in the 1970s, I could still remember me visiting the local banks and bought up all the silver Union & Republic coins that were brought in by local customers who exchanged them for decimal coins e.g. 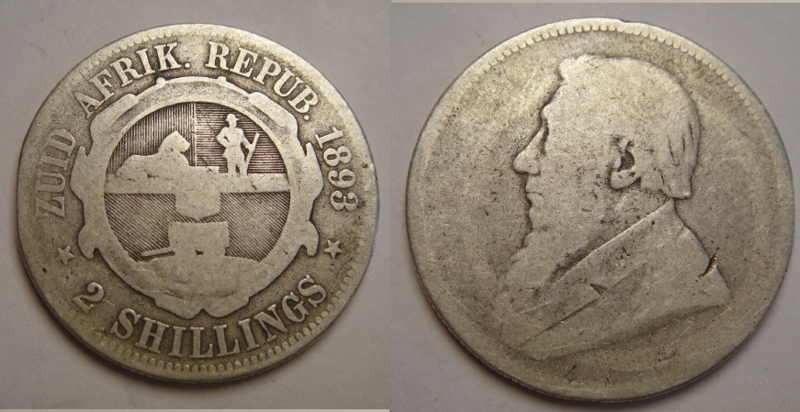 a silver shilling for a nickel 10c. I would then sell the silver coins to City Coins in Cape Town for 4 times their face value, but by the middle 1970s this “silver mine” dried up for me! The silver R1 series from 1965 to 1969 saw very little circulation as their silver bullion value soon passed their monetary value – that is why one seldom finds any of these R1 coins in less than XF condition. In the early 1970s, a local man was given a sentence of R100 by a magistrate. He thought he was very funny by not paying it in paper money (or by cheque) and dumped 100 silver R1 pieces in front of the magistrate – I think on retrospect, the joke was on him. I am not sure how long the second decimal series survived in circulation after the third decimal series was introduced in 1990, but if my memory serves me right, by the turn of the century they were all gone from our pocket change. Regarding your example of the long period in which some 8-Reales circulated (until 1909), I have once read that Roman Copper coins where still excepted by soldiers in the First World War trenches – their acceptance were purely based on their weight as copper pieces – if they were say farthing-sized, they were excepted as farthings. The Bolivian pillars I was referring to were actually the minors, up to 4R though going by what I have seen, it must have almost only been been the 1/2, one and two. I have never seen an 8R in basal condition except ironically, for the 1751 from Chile which I believe is unique. The acceptance of Roman coins makes sense under the circumstances you describe,. I have never heard the term "basal condition"
It must be a US term., It basically means (almost) unrecognizable, as in a Poor-1 on the Sheldon scale. The low grade Bolivia Pillar minors I have seen are usually slightly better than this but invariably damaged or corroded.